A PLAYFUL, YET HARD CHARGING RIDE FOR ALL BOATS ON ALL LAKES! Raph Deromes RDX may feel familiar to those that have ridden a Watson Classic shape in the past, as it borrows some characteristics that generate a solid, predictable drive into and off of any wake. A modern version of the Classic, the RDX makes sure Raph has a playful, yet harder charging ride beneath him for the ultimate boat riding performance. The quad molded-in fins are deep enough for bite when needed, but still allow for a fun, loose ride when desired. A single-inside-double concave center softens all your landings and keeps the board moving forward at a steady pace. With a more aggressive rocker template than the Classic, this board is built to take you to the moon! The RDXs unique tip channels give an easy edge to edge acceleration that, when asked to, can turn on a dime. The board is a true boat board that lets you choose your speed, depending on your moods. Break in rocker curve for aggressive riding style - Flatter center curve for speed & rail control - Exaggerated exit angle through tip gives a bucking pop off wake. Softens landings and maintains faster board speed as water flows out of the tail. Faster on edge with more hold, smooth and catch-free through the center. Smooth and catch-free on the rails with bite and hold on the water. Added lift off of the wake. We engineered unique combinations of special fiberglass weaves to give you the ultimate performance and response on and off the wake. This custom blend of materials increases the boards strength, improves flexural rebound, and reduces weight. Smooth edged fins without the hassle of hardware. These boards are designed and created specifically to provide you with the most enjoyment behind your boat! 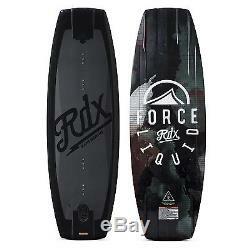 The item "2016 Liquid Force RDX Wakeboard BWF" is in sale since Saturday, September 10, 2016. This item is in the category "Sporting Goods\Water Sports\Wakeboarding & Waterskiing\Wakeboards".